Because of the rapid advancement in technology and the birth of the digital age, darkrooms are not so common these days. 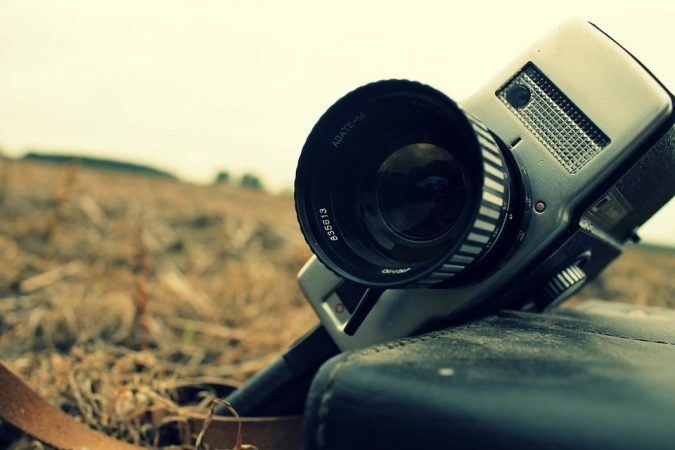 Most people use digital camera or smartphones in taking photos but despite that, there are some photographers and hobbyists who still prefer cameras that make use of films, and some people have bunch of these taken over decades ago. Taking photos and not being able to view them right away gives you an element of surprise once you get a developed copy of those photos. Film and slide scanners were invented in order to convert film negatives, and slides into digital files that can be printed, archived, and shared. 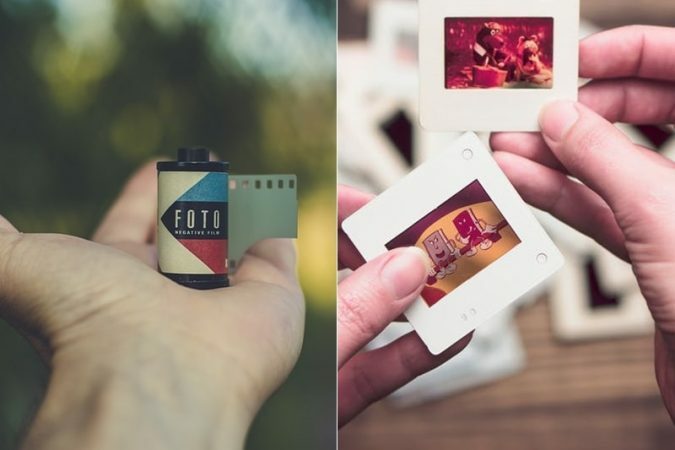 They are meant for those who love to preserve memories from the past that are compiled through negatives and slides and would want a copy of these old photos. Instead of developing the film and scanning the prints to save a digital copy, you save time by using a film or slide scanner. 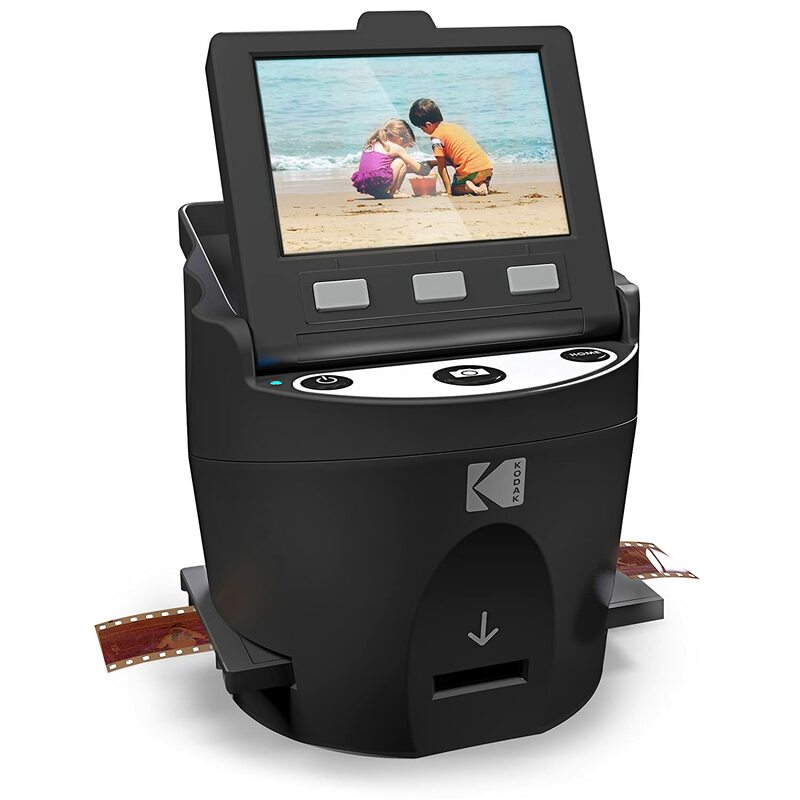 It’s easy to convert various slides and negatives into JPEG format with the Kodak Scanza that allows you to convert both color and black-and-white 35mm, 110, 126, Super 8 and 8mm negatives or slides into a 14 or 22 MP JPEG format. The scanning speed is approximately 1 to 2 seconds. It has a 14 megapixel sensor that captures images in HD clarity but you have the option to enhance image up to 22 megapixels. This scanner has a built in 3.5” LCD color display that can be tilted and adjusted for brightness for image viewing and it also comes with large buttons that lets you scan and instantly save the digital images on a micro SD card. The display will let you know once the memory is full. 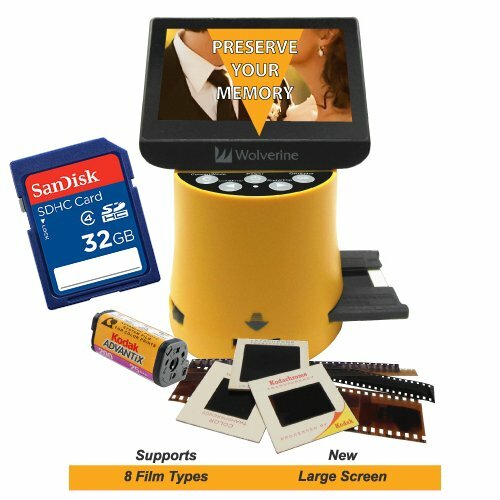 It comes with 3 easy-load slide inserts and 3 adapter trays to be able to scan various film, slides, or negatives. Gallery – to view, rotate, flip, and delete existing photos on the micro SD card. Capture – to scan, save, and adjust the image brightness and RGB. 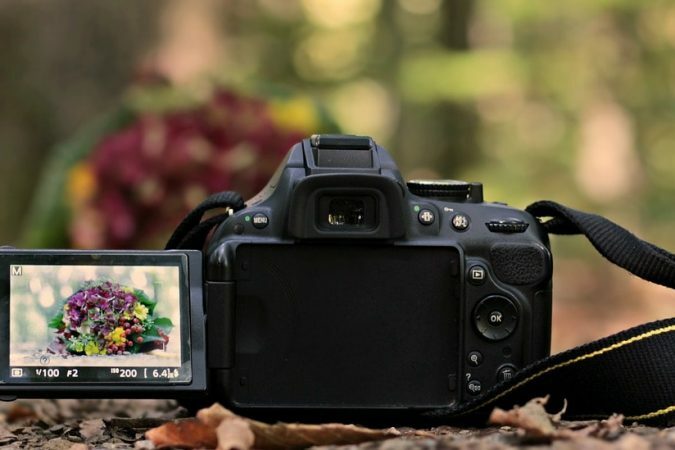 Settings – to change the LCD brightness, resolution, upload the image to the computer, and more. If you are simply looking for a negative to digital scanner that can scan various types of negatives or slides with good quality, then the Kodak Scanza scanner is a great option for you. 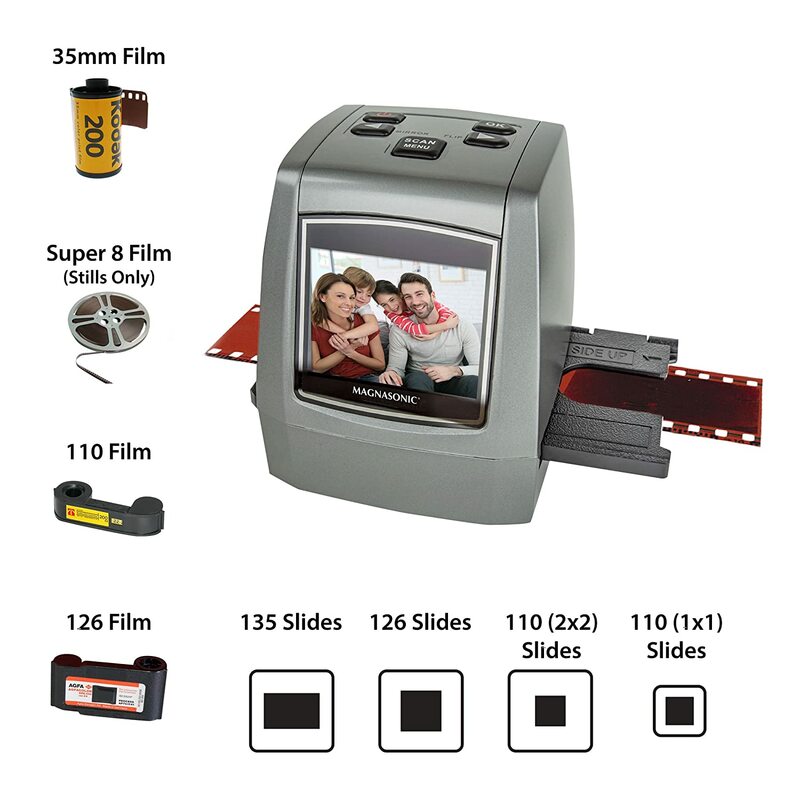 It’s a very handy film scanner that has a large and bright LCD for easy viewing of the photos and is also easy to operate and understand even for people who are not so techy. This scanner is very basic and it only delivers small prints but in high quality so this is not really a great option for pros. Scan 35mm film and mounted slides, 6x22cm medium format panoramic film and documents through a built-in Transparency Unit (TPU) with Epson Perfection V600 scanner which you can use at home, in the office, or in a studio. It has a scanning speed of 1 minute which in this case, for 1 slide. This unit comes with film holders for 35mm film and mounted slides. 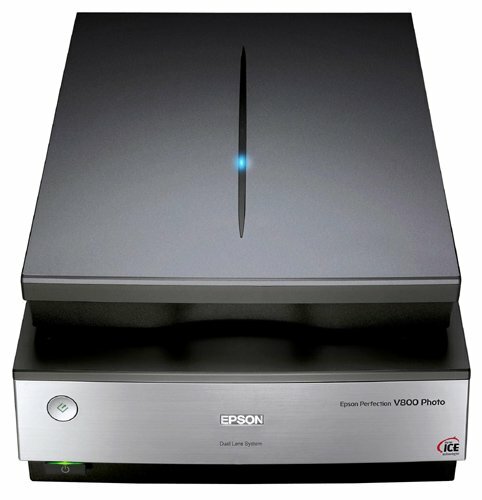 The Epson Perfection V600 scanner allows you to enlarge images up to 17” x 22” that are sharp and vivid copies of the original one with its 6400 x 9600 dpi. Digital ICE for prints allows you to remove the appearance of creases and tears from damaged photos while Digital ICE for film allows you to remove the appearance of scratches and dust from film. Together with Digital, it also features one-touch color restoration and Arcsoft Photostudio for a complete photo restoration solution. It uses ReadyScan LED technology for energy efficiency and increased productivity. It has 4 customizable buttons for scanning, copying, scanning to email, and creating PDFs. 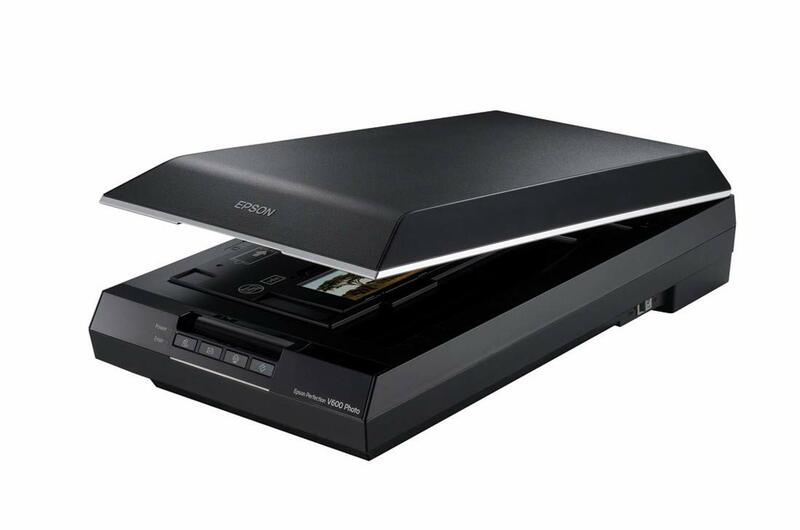 The Epson Perfection V600 scanner is an all in one scanner for negatives, slides, photos, film, and documents. It doesn’t provide quick scans unlike other film and slide scanners but it delivers quality scans and the auto enhancements are great , saving you time in editing the digital copy of the photos using a photo editor that could take 10-20 minutes per photo. The price is reasonable and is worth buying to scan slides, negatives, and films and it can also save you a lot of time and money by having them scanned by pros. 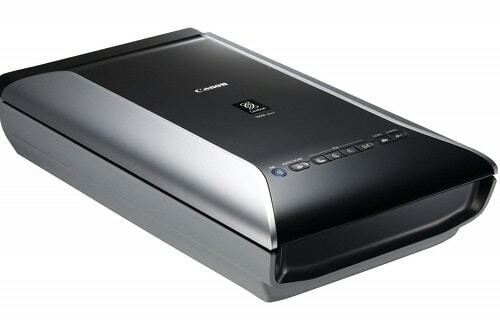 This flatbed scanner from Canon allows you to scan 35mm film, photos and documents – organize files and enhance them easily. It has a scanning speed of 18 seconds for 35mm at 1200 dpi and 7 seconds for other color documents at 300 dpi and a maximum resolution of 9600 x 9600 dpi for film, 4800 x 4800 dpi for other media (optical) and 19,200 x 19,200 dpi (interpolated). 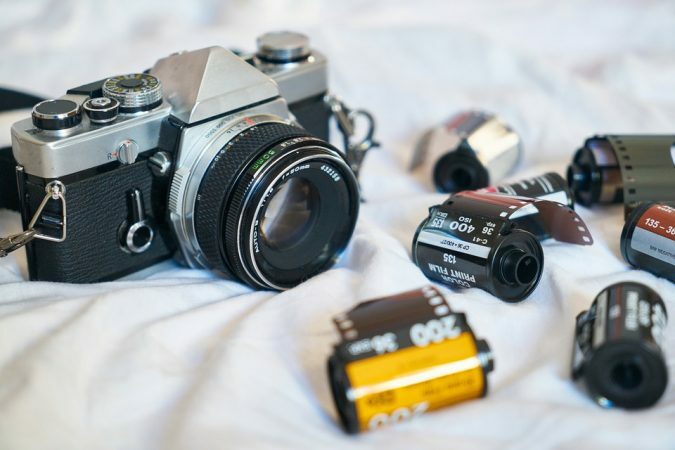 It has a built-in level 3 Film Automatic Retouching and Enhancement (FARE) that applies automatic correction to film and photos, removes scratches and dust, and restores the color. The Auto Scan Mode lets you automatically adjust the settings by detecting what you are scanning. It also features Super Toric Lens that delivers scans that are bright, pin-sharp from edge-to-edge, and have low-noise. The CanoScan 9000F Mark II uses 7 EZ buttons for an easy scanning process. It also uses Auto Document Fix to do area-by-area data correction and advanced image analysis and also Gutter Correction to remove shadows that are usually evident when scanning books. The Cannon CanoScan 9000F MKII flatbed scanner is pretty great for its price and the speed and quality of the scans but it is still far from perfect. The auto scan and the gutter shadow correction are its best features. The correction features are great if you are looking for a photo with enhancements but they tend to be far from the original photos especially with the color. If you have a business and you do restoration of photos from negatives, then the Epson Perfection V800 is the perfect flatbed scanner for you. Get precise scans for 35mm slides, 35mm film strips 6x6cm medium format, and 4×5” large format with the 4 film holders included in the package. This scanner features Digital ICE, just like the V600, to remove scratches and dust, dual-lens scanning for optimum results, LED array for power efficiency and better productivity, a 4.0 Dmax tonal range, and a maximum resolution of 6400 dpi. The scanning speed for 35mm is approximately less than a minute without Digital ICE or SilverFast at 2400 DPI resolution, more than a minute at 4800 and 6400 DPI resolution, and 1 to 5 minutes with Digital ICE or SilverFast depending on the resolution. When scanning, the higher the resolution, the slower the scanning speed is. The scanning speed for 6x6cm medium format is approximately 1 to 2 minutes without Digital ICE or SilverFast depending on the resolution and 4 to 20 minutes with Digital ICE or SilverFast while for 4×5” large format, it takes approximately 4 minutes to 1 hour without Digital ICE or SilverFast and 15 minutes to 2 hours with Digital ICE or SilverFast. If you are looking for a heavy duty film and slide scanner under $1,000, then the Epson Perfection V800 is great for you especially if you are going to use it for business. The scanning speed is slow especially if you use the Digital ICE or SilverFast feature but the scans are great and are close to the original photo despite the auto enhancements. This flatbed scanner also allows you to scan 12 slides in one go giving you more time to do other things while waiting for the scans to finish. Despite its flaws, the scans are great and are of top-quality making it worth its price. Magnasonic All-in-One scanner is a very handy scanner that allows you to convert various slides, negatives, and film such as 35mm film, Super 8 film (stills only), 110 film, 126KPK, 135 slides, 126 slides, 110 (1×1) slides, and 110 (2×2) slides into a 22MP high resolution digital photo JPEG format. The scanning speed is approximately 5 seconds. It has a 128MB built-in memory where you can save a copy of the digitized image or you can also save the files in an SD card. You will be able to instantly view and edit photos on the built-in 2.4” LCD screen. You can also opt to view the images on your pc, laptop, or television with the USB cable and video out TV cable included in the package. 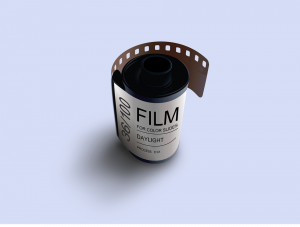 Editing is made easy by the pre-installed film profiles that you can choose from. A portable scanner just like this Magnasonic Film Scanner is good enough for scanning negatives and slides to preserve old family photos. If you have a number of old negatives and slides piled at home and you want to digitize them quickly, this scanner might be a good choice for you. The quality of the scans are good but would still need editing through a photo editing software after scanning them. It is good enough for its price plus it’s a great tool for beginners who are not too tech savvy because of its ease of use. 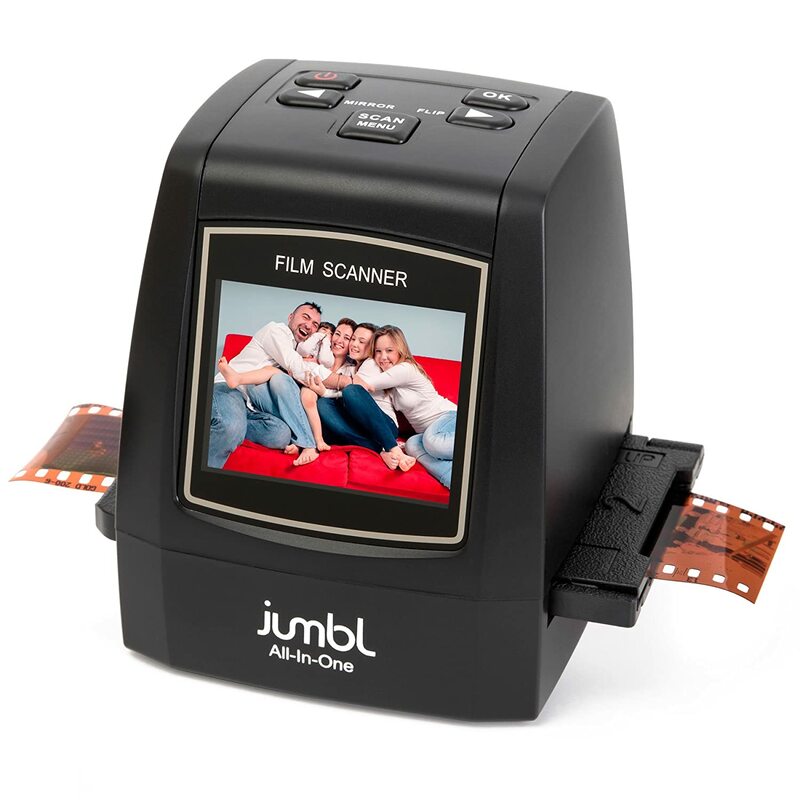 A very portable and accessible scanner that allows you to convert old negatives and slides into a digital format quickly with the help of speed loaders is what the Jumbl 22MP All-in-1 scanner is all about. The scanning speed is approximately 1 to 2 seconds. It can convert 35mm negative & slides, Super 8 films, 110, and 126. This portable scanner has a 14 megapixel sensor but the maximum recording resolution is 22 megapixels. You can easily view and edit the files using the built-in 2.4” color LCD. Save the files using the 128 MB built-in memory or through an SD card. If your purpose is to revive old memories from negatives and slides, then the Jumbl 22MP All-in-1 scanner works fine and does its job but the quality of the image doesn’t match to its competitors especially those ones from flatbed scanners so the images still need to be enhanced or post processed using softwares or photo editors. The resolution and quality of the scanned photos are not of high quality but they are better compared to the output of its competitors that only offer a 5MP resolution. I have fond memories of my childhood and they were captured using film cameras. I would love to have a copy of those wonderful memories and a portable and lightweight digital converter like the Wolverine Titan would be good enough to make digital copies of those old photos. The Wolverine Titan converts 35mm, 110, 126, 127, and APS film, Super 8 & 8mm movies into digital images with a scanning speed of approximately 3 seconds. The 20MP scan resolution is at 5472 x 3648 dpi. It has a built-in 4.3” color LCD screen that allows you to view and edit the photos and a built-in memory to let you save the digital images. In addition, it has both auto & manual settings for adjusting brightness and color balance. It also uses a LED backlight for better performance. A quick solution to preserving old memories by converting old negatives and slides into digital format is through the Wolverine Titan scanner. It’s a low cost solution and its features as a whole is good enough to perform its job in converting old photos into digital copies and you can always use a photo editing software to enhance the photos. This scanner is easy to use and it can also be bought at an affordable price which is a good option for entry level users especially those who are not computer or tech savvy. If you are an amateur or a pro and you don’t mind spending quite a lot for a scanner to convert old negatives and slides into digital copies, then the Nikon LS-30 Coolscan III Film Scanner will be a great option for you. It has a scanning speed of 20 seconds at 2,700 dpi optical resolution. 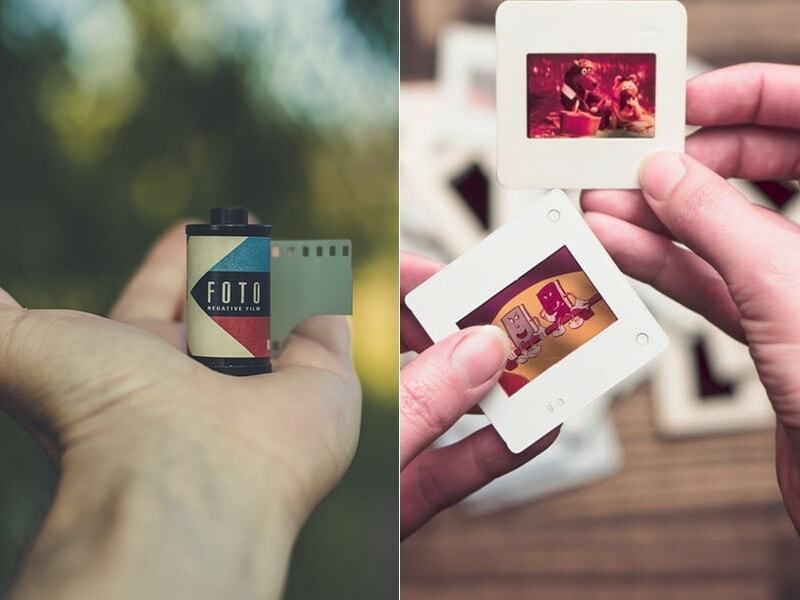 Scanning 35mm film in slide or strip format and Advanced Photo System (APS) film is a breeze. It has features such as the Digital ICE to remove scratches, dust, dirt, fingerprints, etc. The Color Management System which Nikon elusively developed ensures the colors match on the monitors and printers. 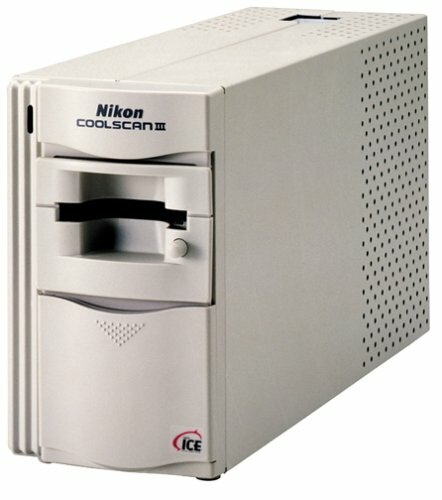 Nikon LS-30 Coolscan III Film Scanner is quite expensive but is recommended for amateurs, professional photographers, and creative ones who are just starting and are looking for a good quality scanner to convert old slides or negatives into digital copies. The performance of this scanner won’t disappoint as you will really get photos that are of top quality and with colors that are similar to the original slides or negatives. It has been produced more than a decade ago but it is still used by many because of its durability and the good quality output it produces. For a person who is always on the go and who loves carrying things that are portable, this is the perfect solution for you to convert negative slides and films into digital. It doesn’t need a power source because it operates on lithium-ion battery that can be removed and can be charged through a USB charging cable. It converts 135 mm slides and negatives, 110, 126, negatives into digital images. Veho Smartfix portable scanner has a bulit-in 2.4” TFT color LCD screen to preview and edit the images using the built-in enhancements. It comes with multiple trays that fit various films, slides, and negatives. 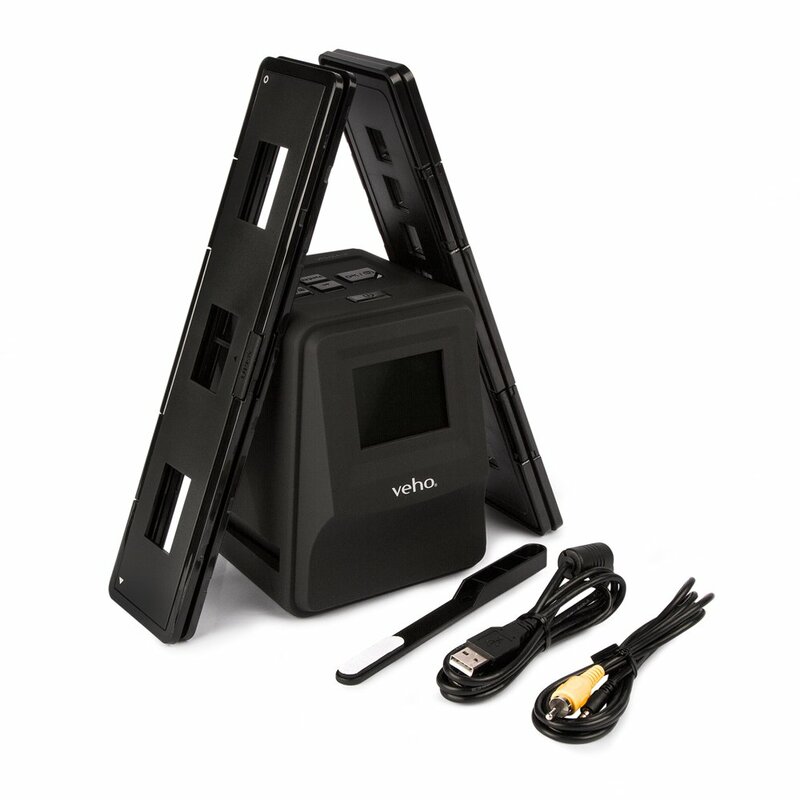 Veho Smartfix Portable Stand Alone Scanner provides digitized images that are of a reasonable quality at a decent price and the digitized images can usually be corrected using the software that comes with it or other photo editing softwares such as Photoshop or Lightroom. Although they are far from professional quality digitized images, the good thing about it is that it is portable so you can bring it anywhere and it can easily scan old negatives and slides to preserve good old memories from the past. 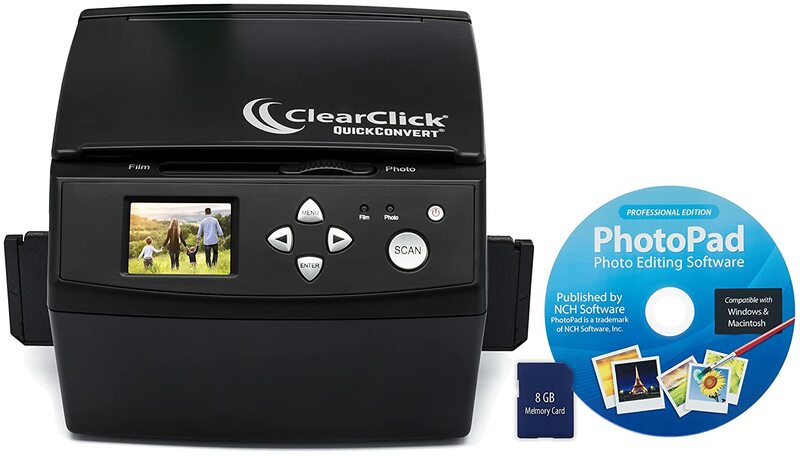 The ClearClick 20 MP QuickConvert Digital Converter speaks for its name as it quickly converts 35mm negatives and slides, and 3×5, 4×6, and 5×7 photos into digital images with a scanning speed of around 2 to 3 seconds. Just like most portable scanners, it works standalone and it has a built-in 2.4” color LCD screen for faster viewing and editing. It has a maximum output of 20 megapixels. The features of ClearClick QuickConvert scanner are similar to most portable film, slide, and negative scanners. The only difference is the software that comes with it. It uses PhotoPad Pro software that allows you to edit and enhance photos easily. The ClearClick 20MP QuickConvert Digital Converter does a pretty much great job in converting 35mm slides and negatives into digital images but it still has a lot of limitations and it could have some improvements especially about the complaints on the dust that easily accumulates on the scanning bed. The price is pretty decent and its quality quite matches its price but it’s still not professional quality and the digital images could still be improved using photo editing softwares. There are a lot of factors to consider when choosing the right scanner. Do you know which features you should look for in a scanner? Is the scanning speed important in choosing the right scanner? What is your priority in choosing a scanner? Would you rather have a scanner that scans quickly but gives a poor quality digital image or one that takes a little bit more time in scanning but definitely gives you a top quality image? You have to weigh your options because you can’t have everything in one. Not all scanners are able to convert various types of film, negative, or slide into a digital format. Some scanners, for example, can only convert 35mm slides or negatives while some can convert a couple of other types of slide, negative, or film. There are also some scanners that have an adjustable feeder so that you can put any kind of slide, negative, or other film into them. You have to be aware of the type of slides or negatives that you have. Most scanners though are compatible with 35mm slides and negatives. Choose a scanner where your slides or negatives would fit because there’s no point in getting a scanner if you slides or negatives won’t fit. 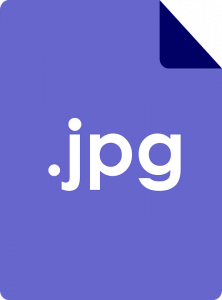 JPEG is the default file format that most scanners have but some scanners can convert files into other formats such as BMP, PNG, and TIFF. If you are particular with the file format, check the file format that the scanner is using. 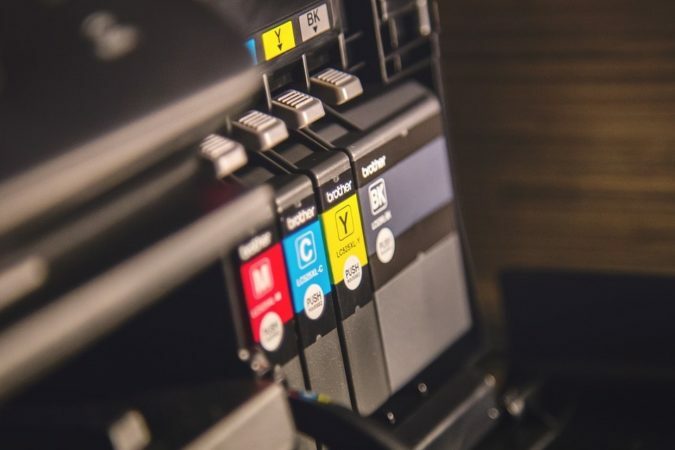 If you are just going to post the digital images on social media or you are planning to make small prints, then you don’t need a scanner with a high resolution because 14 megapixels is good enough. If you are using the scanner for business and you would need to make large prints of the digitized images, then you should go for a scanner that has a higher resolution. Keep in mind though that scanners with a higher resolution have a slower scanning speed. Scanning speed is important but not all scanners that have a quick scanning speed are able to give you good quality scans. The scanning speed shouldn’t be long enough that you would waste a lot of time and won’t be able to do anything when scanning. Scanning speed can be influenced by the resolution and by enhancements. The higher the resolution, the longer it takes to scan and convert into digital format. Applying enhancements through applications such as Digital ICE, FARE, or SilverFast also make it longer to scan images. Look for a scanner with an acceptable scanning speed taking your needs into consideration such as the resolution and enhancements that you would be needing for the digital copies of your photos. Choosing a scanner would depend on your purpose for scanning. Are you going to scan a lot of negatives or slides that you would need a heavy duty one that would last for years or are you just looking for something convenient that would allow you to scan negatives or slides any time and anywhere you want to? Flatbed scanners are a better option when it comes to scanners because of their top quality scans and their durability but there are a couple of portable scanners that do an excellent job with a fair quality of image and they can be bought at an affordable price. If I were to choose a between a scanner that can scan more images in one day and a scanner that can produce good quality digitized images, I would rather go for the latter. 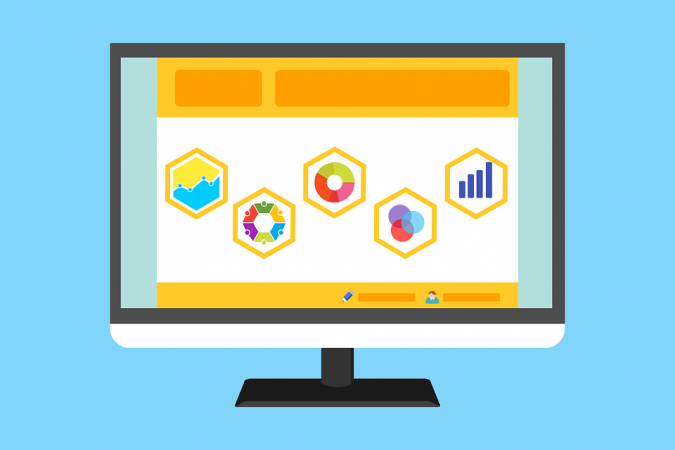 It’s better to go for a scanner that produces a good quality output rather than a scanner that has a quick scanning speed but produces digitized images of low quality. There is no perfect film and slide scanner that has everything but we can see improved versions of these scanners over time. All the scanners listed above have its own set of flaws and good qualities. If I were to choose between quantity or quality, I’d rather go for quality because I think having top quality gives more value to the money that I’m willing to spend on a scanner. The best scanner for me would be the Epson Perfection V800 because of its overall features especially when you factor in the scanning speed, quality of the scans, and the distinct features that can’t be found in other scanners. It may not be lightweight but it works best and it almost gives a professional quality scan that’s good enough for printing these digital copies.